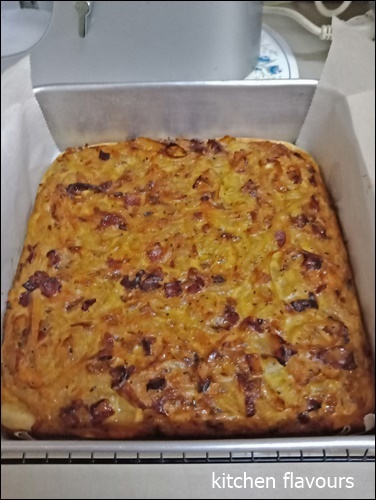 I made this Savoury Onion Cake, which is a yeasted bread with onions and bacon topping, from Classic German Baking by Luisa Weiss. According to the author, "Zwiebelkuchen, which translates literally to "onion cake", is a yeasted bread topped with sauteed onions, bacon, caraway seeds and beaten eggs that is baked until golden brown and blistery". It is a soft yeasted bread similar to a focaccia, with the topping similar to a quiche (minus the cream and milk). Very easy dough to work with; soft, smooth and silky. To make the topping, saute some chopped bacon in a large saucepan, then add the sliced onions, caraway seeds and pepper, continue to cook until the onions are coloured. Remove from heat and let cool slightly. 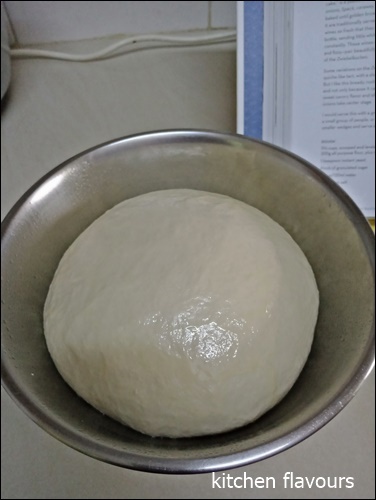 Place the risen dough in a 10-inch round cake pan, (I have used a 9" square pan instead), pushing the dough to cover the base, and set aside for 30 ninutes, covered. Meanwhile, beat some eggs and add to the onion mixture, I've added a pinch of salt. Scrape the mixture onto the dough and bake in a preheated oven for 40 minutes. If the onions are browning too quickly, tent the top with a piece of foil. It smells really delicious while baking. And it tasted delicious. The bread has very soft lovely crumb and the topping is very tasty. I've used 3/4 teaspoon of caraway seeds, which is just about right. I love the caramelized onions with the caraway seeds. I would gladly make this again. Yums! 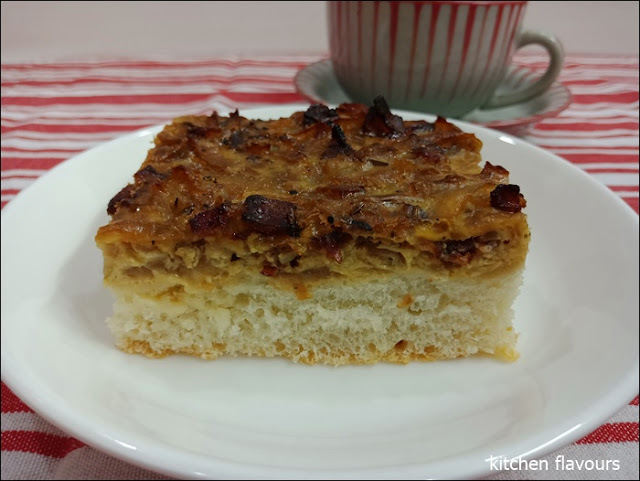 Click on the link here, for the recipe and overall review on this fabulous book, Classic German Baking. 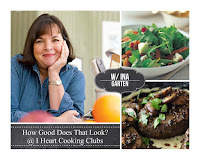 I Heart Cooking Clubs (IHCC), theme for this week is How Good Does That Look?, Ina's popular phrase in her cooking shows, when she has cooked a delicious recipe, and plated, she would say just that. I've made one of her simple vegetable recipe for dinner. String Beans with Shallots. Ina has her string beans boiled briefly in salted boiling water. I have gone the microwave route. Placed the french beans in a microwave bowl, sprinkle with 2 tablespoons of water with a light pinch of salt, microwave on high for 1 minute, stir, repeat, stir and repeat again. Refresh under cold running water in a colander. Drain. I have used about 6 or 7 shallots, and have skipped the butter, using only vegetable oil. 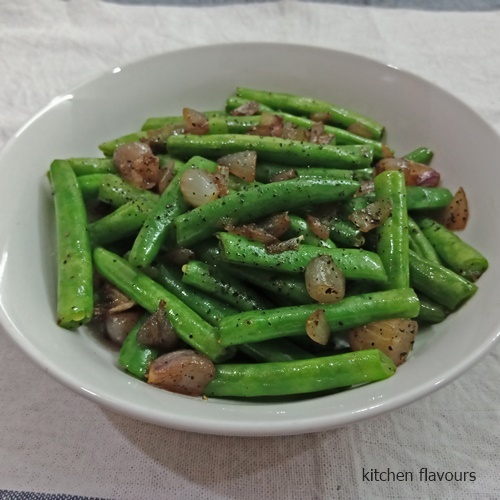 The chopped shallots are sauteed in oil until lightly brown and the french beans are added to the shallots, with some salt and lots of black pepper, tossing the beans until they are heated through. 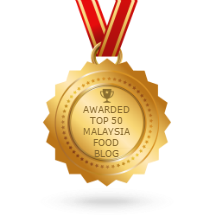 Simple, easy and taste nice too! We had the french beans served alongside Madhur Jaffrey's Pork Vindaloo with Potatoes, and plain basmati rice. It was a lovely dinner. Blanch the string beans in a large pot of boiling salted water for 1-1/2 minutes only. Drain immediately and immerse in a bowl of iced water. 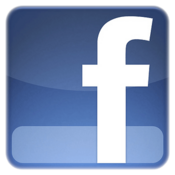 Heat the butter and oil in a very large saute pan (12-inch diameter) or large pot and saute the shallots on medium heat for 5 to 10 minutes, tossing occasionally, until lightly browned. Drain the string beans and add to the shallots with 1/2 teaspoon salt and the pepper, tossing well. Heat only until the beans are hot. If you're using regular string beans, blanch them for 3 minutes, until they're crisp-tender.